I haven’t done a “GM Bad Idea” segment in a while. This is not because GM has stopped having bad ideas. On the contrary, I have seen several new Cadillac XTSs on the road, and there’s absolutely no way they were purchased by anyone who didn’t receive an enormous GM incentive. But I’m not here to knock the Cadillac XTS. That can be done in a future column. 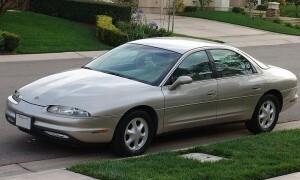 Instead, I’m going to call out another bad idea from our friends at General Motors: the Oldsmobile Aurora. You may remember the original Aurora. It’s the car that resembles a rather large, windswept sand dune. It also had no grille, apparently under the theory that: it worked for the Ford Taurus in 1986, so it’ll work for us today. The Aurora was just as strange inside, by virtue of being one of those 1990s cars (and there were quite a few) that had an air vent on the door. It also had a dash that was curved towards the driver, though the material quality was such that most drivers probably wished it was a little further away. We all know what happened to the Aurora: despite GM’s best intentions, the second-generation model was completely boring, and – eventually – the brand shut down for good. That was probably one of GM’s few good ideas. Still, I will always remember the Aurora fondly, provided I don’t think about it too hard. Doug, How far had Government Motors dropped Oldsmobile with the Aurora from the Cutlass of the late ’70′s or the 4-4-2 with Hurst shifter to a vanilla car that makes a Taurus look exciting and well designed? Ransom E. spun in his grave. The 1903 Curved Dash was a better cutting edge design for its first decade 20th century era than the Aurora which slogged towards the millenium close. So true. Although frankly I think we both could think of some Pontiacs that were an even bigger fall from grace. Whether the Aurora, Taurus, Infiniti, or early ’90s Civic, Passat or Elantra, I just never understood the grill-less attraction. Seriously, cars need a proper face. The Auroras otherwise were very attractive cars at a high price. Sadly, by that time nothing was going to save Olds…. I have the same issue. Grilles are nice… That said, I actually did like the ’86 Taurus – but maybe it’s purely due to historical perspective. I think we can agree that the Lexus SC300/400 gets a pass on the grill-less design. They actually added a small little slit grill in the later years and it totally ruined the design (imo). My 70+ mother bought one of these lightly used after I convinced her that her ’89 Buick Electra T-Type needed replacement. I was a little surprised when she came home with this instead of a Park Avenue. I remember it had great seats and a killer Bose stereo. But you felt buried in that wrap-around “cockpit” and with the droopy front and rear ends you never knew where the four corners of the car were. Hers was the same color as the one in the pictures, and the interior was a coordinated monotone taupe. After 3 or 4 years, all the coordinated taupe leather, vinyl, carpet, and plastic had faded to different colors. To its credit though, it was pretty much trouble free for the 10+ years she had it. The Aurora had all the deficiencies you identify and probably more, but it’s also important to note that it was the best driving car GM built in ’95, with the possible exception of the Corvette (and the build quality of the Corvette was probably dramatically worse). It was certainly better than any car Oldsmobile had then built since about 1972. But let me add a note about GM’s brilliant marketing. The car was ONLY sold as an Aurora. 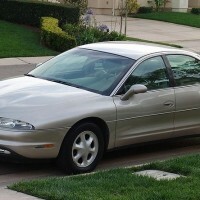 Not an “Oldsmobile Aurora.” Not an “Aurora by Oldsmobile.” They did this because even GM realized that in just 20 years it had destroyed nearly all of Oldsmobile’s brand equity. The consequence was that (a) nobody who saw an Aurora and was interested in learning more knew where to go and (b) the only car Oldsmobile was selling that wasn’t a steaming pile of dog doo could do nothing for Oldsmobile’s image. Brilliant! Hah! Great post and very interesting. GM had several cars at the time where they wanted the model to stand above the brand (Catera) but Aurora sounds like the best example. Of course Hyundai is now doing the same with Genesis and Equus. The question is: has this EVER worked? Of course it can work. “Cimarron by Cadillac.” “Chrysler’s TC by Maserati.” Oh, never mind. I always felt it should have been sold as a Saturn. Jeez, does the Aurora really deserve this harsh criticism? It was a great-looking car for the ’90′s, and still looks pretty good today. The spaceship-y shifter was really cool as well. In my opinion, Olds was actually building some decent product when they got the ax: Intrigue and Alero were fully competitive, and the Achieva was a decent performance value if I am not mistaken. Aurora wasn’t all bad. It all depended on how you wanted to view it. It didn’t age well. What’s with all the hate towards angling the IP towards the driver? In today’s cars it makes sense. Hell, even with my 6’2″ body frame and arm length I am constantly having to reach up out of my seat to reach the far right side of the IP. It should be noted I’m in a Focus and it’s really not that big of a car. If the entire center stack was angled towards the driver it would be a easier reach. Saab did it with the 93 and I thought it looked great. Am I a small minority of the driver focused IP?